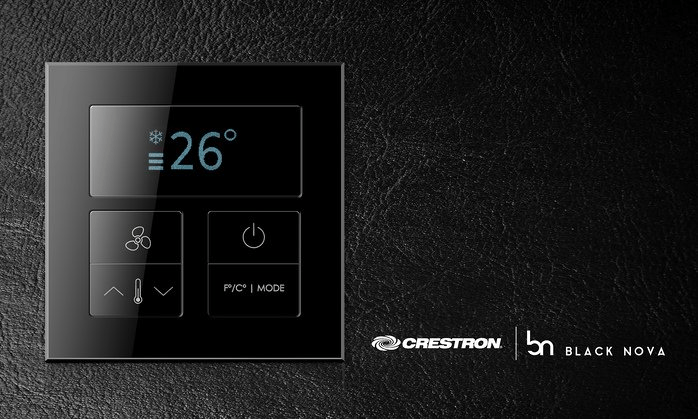 Crestron has announced that through a strategic partnership with Black Nova, the ARIA, ALBA and ANY collections of keypads and touch panels are now Crestron Connected products. Crestron residential dealers can now integrate them in their system designs using the Cresnet bus to deliver custom control features and functionality. “As this exciting new partnership demonstrates, we’re fully committed to broadening the advanced control options available to our residential dealers and their clients,” says Crestron vice president, residential John Clancy. ARIA Collection: A tribute to the minimalist aesthetics of the 20th century. Their straight lines, simple shapes, vivid colors and perfect glass surfaces are a stylish match for any interiors. ALBA Collection: Large, easy-to-use buttons with engraved icons and text are flush with the design frame. Available in 2-, 4- and 8-button configurations, and in metal or glass finishes. ANY Collection: ANY touch panels combine striking design with an intuitive user interface. They’re packed with the latest sensors including proximity, gesture, ambient light, colour and temperature. The post Black Nova keypads and touch panels join Crestron range appeared first on Connected Magazine.